Spring offers plenty of new vitality to the neighborhood from outdoor fairs to flowers to volleyball games at the Pier. It also means the addition of many new puppies to the neighborhood. As a dog owner, I have met a lot of new dog owners asking many questions, which I now turn over to Certified Professional Trainer, Robert Haussman, owner of DogBoy Inc.
Robert helped me become the alpha of my French Bulldog, he also helped train Mayor Bloomberg’s dogs Bonnie and Clyde, has been featured in The New York Times, USA Today, People’s Pet website peoplepets.com, and tonight will appear on Bravo’s show “Pregnant in Heels” training another French Bulldog. 1. Socialize with dogs, people, kids like crazy before 16 weeks. The sooner the better. It’s ok to meet dogs who are vaccinated and clean. 2. Get your new puppy or dog use to being handle and having human hands in and around their food. Teach your dog hands around food and treasured objects equals tasty treats and pleasant petting. Make sure to your dog associates having his paws, tail and ears handled as a fun,exciting event. 3. Bring your puppy to meet the vet and groomer regularly before they actually need to go. They should make a good association with these locations and people before they go there for vaccines or nail trimming. These will prevent big issues down the road. Q: How much space should be left between a collar or harness and my dog? A: You should be able to slip 2 fingers under your dogs collar/ harness, not your whole hand. It shouldn’t choke him but loose collars slip off and can be dangerous. And yes harnesses slip off to! Q: I ran into a woman who’s puppy hadn’t had all of it’s shots but was taking her dog into an empty dog park to get him used to it. What are the unseen health risks in a dog park? A: Yikes! Dogs or no dogs the dog park is a petrie dish of infectious disease to an unvaccinated pup. It’s good to expose your dog to as many people, animals, places and things. But it is just as important to do it safely. Unvaccinated pups should avoid dog parks, tree beds and dogs straight from the park. You can even bring in dangerous bugs into your home on your shoes. Be careful and discuss the dangers with your vet. Q: How long does it usually take to potty train a dog? A: No two dog are the same, some may take a bit longer and some may figure it out 1-2-3. Mini and toy breeds tend to take a bit longer then larger dogs. If you are consistent in you house training, you could see some results as early as 3 months. You should be sitting pretty somewhere in the 4 to 6 month range but you may see some accidents up to 8 months or so. Hang in there! Q:How much exercise does my dog actually need? A:A dog’s exercise needs varies from breed, size and age. Dogs require at least 1/2 hour of aerobic activity a day. That doesn’t mean running in little circles around the yard or fetching up and down the hall. More athletic breeds require more while giant breeds and older dogs need less. Also ask your vet if your dog is old enough for higher intensity exercise like long runs or an agility course before going forward. A well exercised dog is a happy dog who is easy to live with. Q: What exactly does ‘curb your dog’ mean? A: Quite simply, bring your dog out to where the curb meets the street to do his business. This way when he has a soft stool you don’t fingerprint the sidewalk picking it up. If its in the gutter, pick it up as best as you can and the rest is the street sweepers problem. It’s a bit more sanitary and keeps your neighbors stoop urine free, as well as tree beds, sidewalks and bikes which get peed on regularly. Thank you Rob! Aside from one-on-one training, Rob is teaching puppy classes at The WagClub. 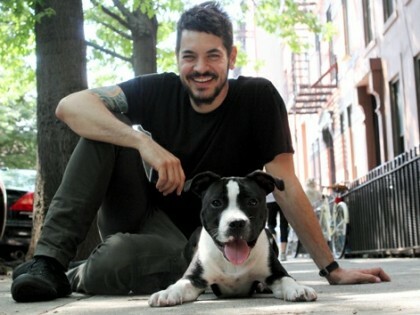 His website is: http://dogboynyc.com/ and don’t forget to watch him on “Pregnant in Heels” tonight on Bravo. Ruff! He’s hot! My tail is wagging. Curb Your Dog!!! Yes!!! Thank you Rob for promoting this practice. Many thanks to Robert Haussman for explaining the “curb your dog” rule. Based on casual observation of neighborhood dog walking practices, and on the evidence that gets deposited on the sidewalk in front of our building (often right in front of the posted “please curb your dog” sign), the dog owners who follow this rule are very, very few!